Lucy has worked with me for 25 years! A twist on the classic Victoria sandwich, her slices look adorable and are, of course, divine to eat! Equipment and preparaton: for this recipe you will need a 30x23cm/12x9in traybake tin. Preheat the oven to 180C/160C Fan/Gas 4. Grease the traybake tin with butter or baking spread and line the base and sides with baking paper. Measure all the cake ingredients into a large bowl and beat well using an electric mixer for about 2 minutes until well blended. Turn the mixture out into the prepared tin and smooth the surface. Bake for 35 minutes, or until the cake has shrunk from the sides of the tin and springs back when pressed in the centre with your fingertips. Leave to cool in the tin. Remove the cake from the tin and trim the edges so they are perfectly straight. Cut the cake lengthways into three strips, then cut across each strip to give nine 7x3cm/2 ¾ x1½in slices. Cut each slice in half horizontally ready for filling as you would a sandwich. For the filling, spoon the jam into a bowl with the lemon juice and blend together, then toss the strawberries in the jam to give a glaze. Mix the whipped cream and crème fraîche together and spread or pipe a fairly thick layer over the base of each half-sponge. 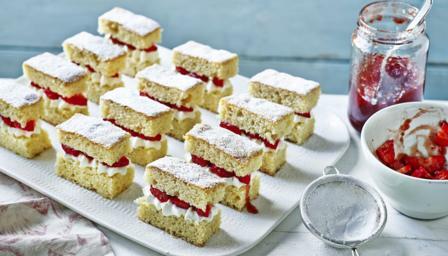 Arrange two or three glazed pieces of strawberry on top and sit the top half of the sponge on top. Dust with icing sugar to serve.